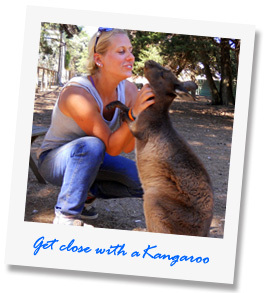 In our guided tour you meet a lot of our animals. 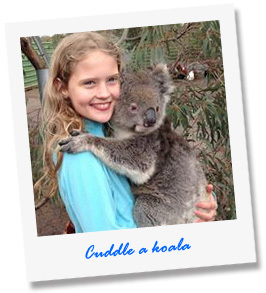 Cuddle a koala, bottlefeed baby animals or hold a kangaroo. Get wrapped up by a snake or hold a possum. The tour is entertaining and informative with something special for anyone who cares for animals and brings a sense of humor. There is also a small farm section, where you get introduces to a working farm with sheep shearing (seasonal). Meet our domestic animals, the birds or have a ponyride. Ponyrides are included for every child in the tour price (height/weight restrictions apply). And don’t forget our reptiles. Touch and learn about these beautiful and misunderstood animals. You can see, touch and hold several pythons and lizards. In the tour there are some great photo opportunities. These guests have taken their chances already. Plan your visit – read more about the operating hours, duration of the tour and admission. Contact us - read about how to contact us. Opening hours and days are limited and seasonal. Open Tues, Thurs, Fri & Sun. At 12pm with last tour at 1pm. Open daily at 12pm with the last tour at 2pm. 26 December to 10 January & Easter Fri,Sat,Sun: Last tour 3pm. Closed: 17, 23, 24 & 25 December and 25 October. Private tours are available. Any groups with more than 15 people please contact us prior. Get your directions from Google maps. One of our visitors, Sébastien Plourde, made this beautiful video of their experience of the tour at Paul's Place and their trip to Kangaroo Island. Thank you so much, Sébastien! See ya at Paul’s Place! Please note that opening hours and days are limited and seasonal. Find our operation hours. © 2019 Paul's Place Wildlife Sanctuary: Animal Encounters for Everyone!